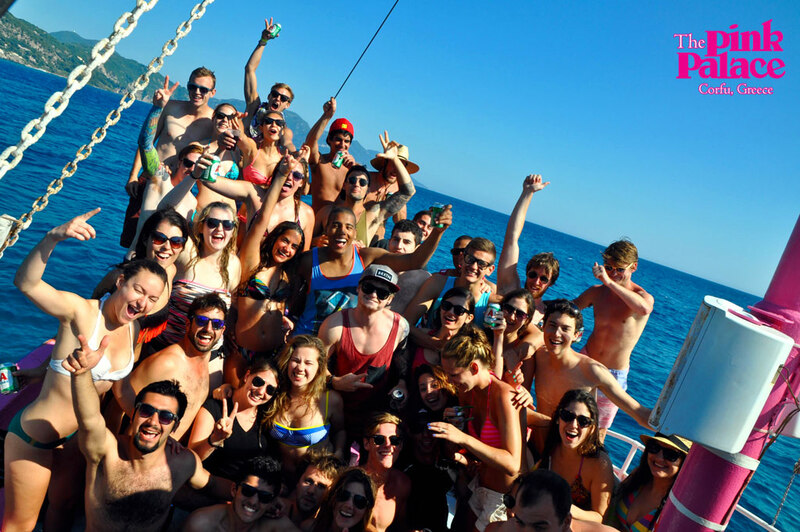 You’ve heard about the legendary Pink Palace Booze Cruise, right? For years Greece’s world famous Youth Hotel & Hostel has hosted Corfu’s best boat party, taking young travellers out for a day on the beautiful shores of Agios Gordios Beach. On mornings when Captain George gives us the clear that the sea is calm and the boat is ready to go, you’ll hear our staff at breakfast chanting with excitement to prepare for what will be one of your most epic travel adventures. Sign up at reception before 11 am and meet down at the Beach Bar by 12pm. For 30€ you receive 4 drink tokens and a 5 hour cruise of music and partying on the water. It’s important to note that there is not food available on board, so buy some snacks and a sandwich from The Beach Bar to bring with you on board… Unless you want to fill up on whipped cream! Say what? Whipped cream? We won’t give too much away, but let’s just say, this exciting party is one you do not want to miss! What’s not to love about drinking and dancing out on the turquoise coast of on the beautiful Greek Island of Corfu? After the Captain does his introductory speech, the bar will open and you can get drinking! 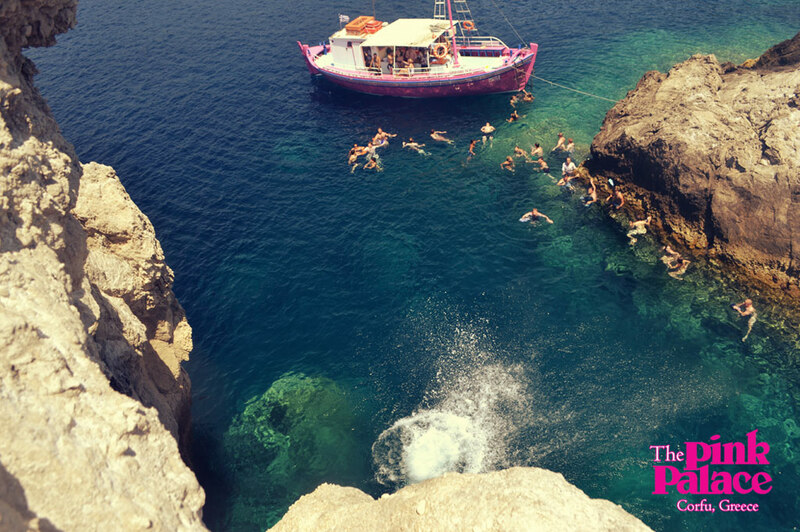 We spend time chilling out at a secluded beach and go cliff jumping at the bat caves! Rock shoes are a great idea if you plan to climb and jump from the cliff– our boys will demonstrate the safe way to get up, Bonus points if you make your jump creative… you’ll see what we mean. Bring your camera or go-pro, and be sure to tag The Pink Palace in your pics! The notorious Booze Cruise has been part of The Pink Palace history for decades. Stories of what happened on this one-of-a-kind party continue to be raved about by veteran backpackers. Make this history a part of your travels!